I finally have blocked and styled photos of the finished half pi shawl for you. You had given up on seeing it finished, hadn’t you? All in good time, my friends. 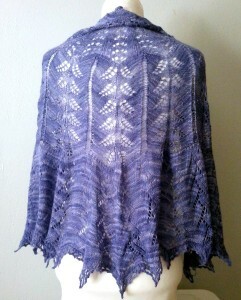 If you recall, that last round of finishitis included this shawl too. The shawl washed and blocked like a dream, and the lace opened up beautifully. There was one sticking point, however. Remember how I was worried about the transition between the third and fourth sections? (If not, click that link and read about it. Then come back. I’ll wait.) 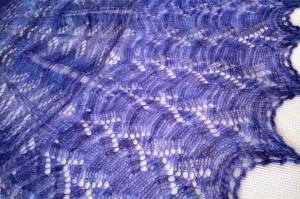 That point is exactly where the blocking experienced a little hiccup. Can you see it? The third section is a little too tightly stretched as it gets closer to the fourth section. Since I doubled my stitch count at the transition between the third and fourth section, the issue may not be a lack of stitches at the beginning of the fourth section. In blocking I found that the top of the fourth section definitely had a sufficient amount of give in the fabric. But just across that line, in the bottom of the third section, there was not enough give in the fabric. I can either solve this by increasing earlier in the third section or distributing the increases evenly throughout the third section. Either solution will give me the same quantity of stitches at the beginning of the fourth section as in my knitted example. Or I could change the design completely to omit the third section, bringing the second section down and the fourth section up to meet each other. I’m actually leaning toward this solution, for a very simple reason. 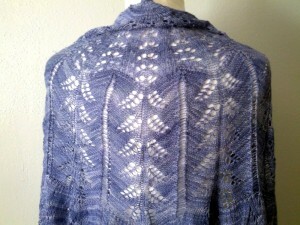 The pattern in the third section is too different from the others, and interrupts the flow of the overall design. 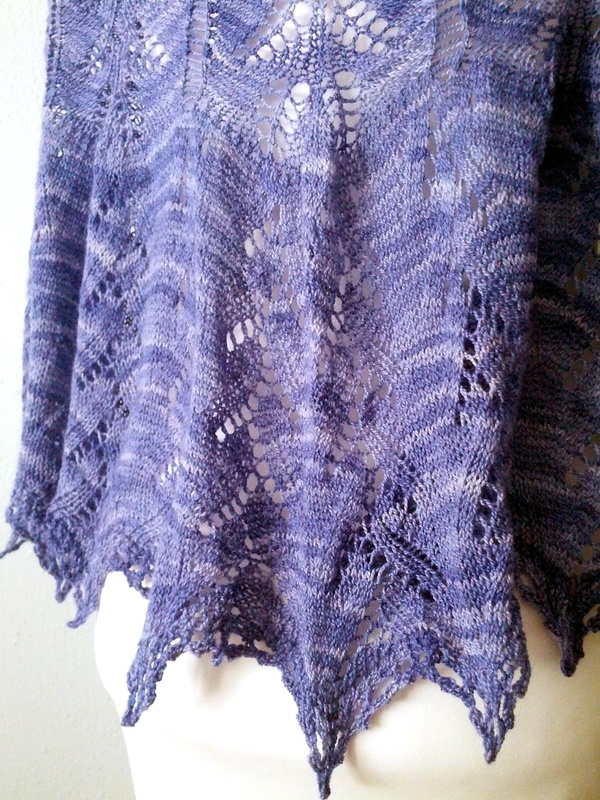 This shawl is for spring after all, and represents all things simple and refreshing. The third section is lovely, but is a bit too busy for this particular application. Shown draped on the dress form, the patterning becomes more apparent. I’m much more satisfied with the project, seeing it like this. It is a very good size, staying put on the shoulders and generously covering the back and upper arms. The weight is also perfect for chasing the chill on a cool evening or in an air conditioned restaurant. I wouldn’t change either of those elements. What do you think? Does your eye naturally wander from the smaller patterns at the top down to the bottom? Or are you caught in the larger pattern of that third section? 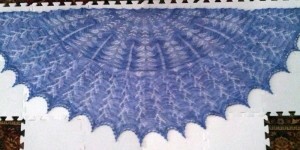 This entry was posted in Knitting and tagged blue, creativity, design, knitting, lace, shawl, spring, wool. Bookmark the permalink.